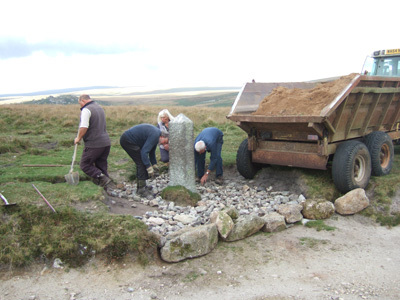 In November 2012 the Dartmoor Society initiated a project with South West Water, Maristow Estate, the Duchy of Cornwall and commoners to ensure that all PCWW boundstones between South Hessary Tor and the Scout Hut at Drizzlecombe (which follows the Cramber Tor Training Area boundary), are in good condition by 2017 (the centenary of their erection). The project stems from a condition survey, for the Ministry of Defence, of archaeological features within the Cramber Tor Training Area, which was completed in February 2012. 27 stones (6 of them not marked PCWW) were identified as being in need of attention (ranging from cutting rushes round the base to re-erection). Following photographic survey and site visits, the first practical work was undertaken on 2 October 2014 with vehicles (tractor, trailer and Matbro) provided by grazier Graham Colton. With driver Mark Cole and a group of volunteers from the Dartmoor Society (Simon Booty who also supplied a Land Rover and tools, Tom & Elisabeth Greeves, Barry & Tanya Welch), the process of filling hollows around eight PCWW stones (and uprighting one of them which had a very slight lean) was begun, starting near the Scout Hut. We expect to do some more work here in 2015 and then move on to the stones in the Eylesbarrow – Nuns Cross – South Hessary Tor area. Note: PCWW stands for ‘Plymouth Corporation Water Works’ and most of the stones being tackled have the inscription PCWW 1917 on them. They mark the watershed of Burrator reservoir.